Guests can enjoy dining at the Rifflin'Hitch Lodge in Southern Labrador where fine meals are cooked to perfection. The Rifflin'Hitch Lodge in Southern Labrador is a five star location for accommodations and at meal times the dining table is set for guests to enjoy fine meals prepared, cooked and served by professional chefs. Many stories and memories are gathered by the guests as they enjoy delectable meals in the fine dining area of the lodge. Set dining table at the Rifflin'Hitch Lodge in Southern Labrador, Labrador, Canada. 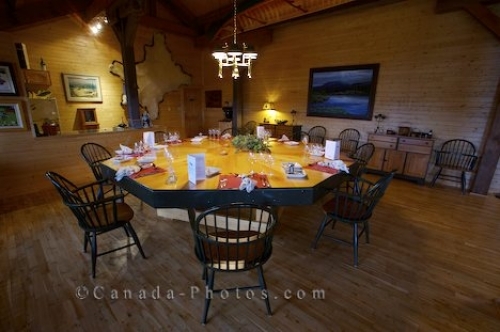 Picture of a fine dining table set for the guests at the Rifflin'Hitch Lodge in Southern Labrador in Canada.